This articles describe will teach you how to create charts. 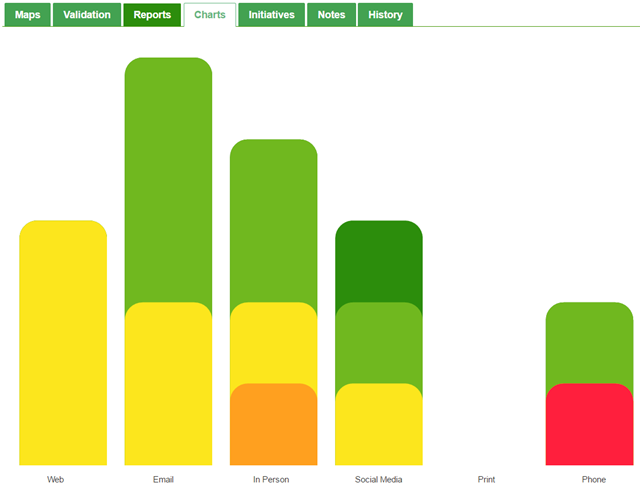 Touchpoint Dashboard allows you to create different types of charts. Charts are a useful way to visualize and analyze your touchpoint data. 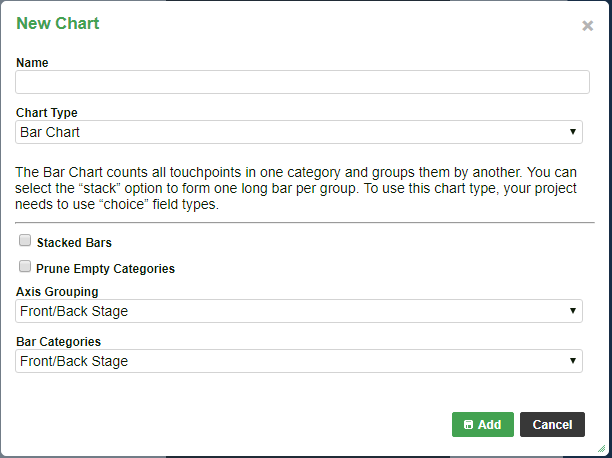 Drill into chart to create a real-time report so you can view the data behind the chart. Follow the following steps to create a new chart. In this example, we will create a bar chart with Emotions as the bottom Axis and the Channels as categories. 1 . In chart view, Click 'Add Chart' icon in the left sidebar. 2 .The popup box below appears. Type a name for the new chart and choose the chart type from the drop-down box. For this example, using the Swedish Store Demo, choose Bar Charts under ‘Chart Type’, select ‘Stacked Bars’ and ‘Prune Empty Categories’ then select ‘Channel’ under Axis Grouping (This will be the bottom axis) and ‘Emotion as your category and click ‘Add’. 3. The page will refresh and display the newly created chart.